The client is internationally renowned for high end parking services and my brief was in the full redesign of the clients corporate website, following are key moments in the work. "From my perspective the current website is old fashioned. I'd like a modern site, with great images, smiling ECP staff and a ‘solid’ look and feel. Professional, big but with a family business touch." We agreed on the importance of a coherent visual style and the need for an update however, it became apparent that the user experience was yet to be considered. Following my value proposition for a user centred approach, I explained that the prosperity of the site depends on usability more so than the undeniably dated visuals. The function of the website serves two distinct users, potential new business and members of the public there to pay a PCN (parking charge notice). Making the latter a painless process for a broad demographic whilst tailoring to new business conversion defined the business needs. The user centred design approach calls for an insight into customer needs values and expectations. To achieve this and determine the face of the target audience, I interviewed the clients new business manager to find out what kind of people he pitches to. It quickly became apparent that facilities managers or independent owners of car parks were mostly middle aged men, often referred to the website for a breakdown of specific services. In pitching to potential clients the interviewee explained, he would make his case for new tender with an example of how ECP services have been successful in the past. In his interpretation, this was the most effective way to obtain new business. The people he dealt with saw value in practical solutions to preexisting car parking issues, they were indifferent and factual concerned more so with seamless integration than costings. Home page should reference specific services. New page creation for case studies. The content audit uncovered usability issues such as long winded title names, a lack of hierarchy and poor navigation. This process gave me further insight into how the IA (information architecture) could be restructured to align with the business requirements. Further to the content audit I conducted a competitor audit using the British Parking Association's Approved Operators list found here. I came across a car parking website that used a services slider on their homepage and at the footer of every page following. I brought this research to the client and yet, her response was that it "looked cheap" and disproved the notion on first glance. The services slider was however, succinct with the interview insight and successfully utilised by a direct competitor in all save aesthetic appeal. Qualitative research followed in my efforts to approve the use of a slider and show how aesthetic adjustments could be made. 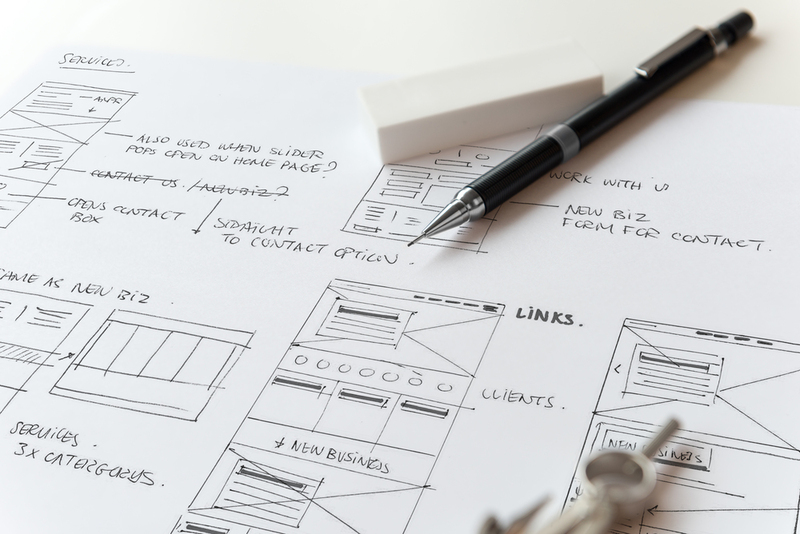 With an understanding of the business and user needs ascertained the ideation and concept phase began with analog wireframes followed by low fidelity Axure mock ups, to plan the MVP (minimum viable product) for user testing. Once the site mock up was complete, the new business manager and I tested the MVP internally with employees from the key accounts department. During the test I realised that whilst key content was easily accessible the call to action for potential business lacked exposure. Following a process of task flow analysis and further reference to the business requirements a 'work with us' module was implemented to precede the footer across all pages. I proposed the 'work with us' button to open a contact dialogue box within the current page module, making the message function quicker and more usable whilst creating a feedback loop to imply seamless integration and efficiency. See the next case study for the Adelphi Neuro-Compass project.